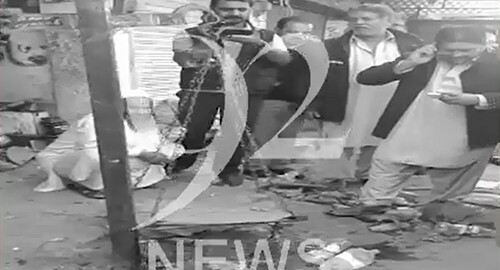 RAWALPINDI (92 News) – Two people were killed while three others injured when a cylinder exploded in a shop of used goods in Rawalpindi’s Dheri Hassanabad area on Wednesday. The deceased were identified as Ajmal and Sher Ali. The injured have been shifted to hospital. Pak Army jawans have besieged the area. In another incident in Layyah, five people were injured when a cylinder placed on the cart of a vendor exploded in a bazaar. Meanwhile, three workers were injured in an explosion in a coalmine in Loralai.